Mosaics constructed of glass, travertine, ceramic, or marble have long been a popular accent material for church interiors. Centuries ago, architects charged with the job of creating religiously themed interior designs contracted local masons to come up with spectacular insets made of natural stone. Today, stained glass and highlighted stone mosaics are still an integral part of religious architecture. Locating an affordable source of top-quality mosaic patterns is easy. Choosing a direct importer of natural stone accessories is the best bet for obtaining premium material at wholesale prices. Nalboor Tiles is the showcase website for Stonexchange, a manufacturer, importer, and distributor of marble, granite, travertine, and glass/resin products for commercial construction projects. We specialize in mosaic patterns for churches, and we deliver our products directly to the client. Stonexchange owns and operates fabrication centers in the Mediterranean region, and these manufacturing centers produce stone floor tiles, floor thresholds, window sills, paver stones, and glass/stone mosaics. Our bulk import method means tremendous savings for contractors wanting the best price on full-crate orders of fine-quality mosaics and inset pieces. Mosaic designs vary according to the materials used and any coating or painting that may be applied. Stained glass interiors generally incorporate glass or glass/resin tile borders into the overall design. Larger wall mosaics that depict religious scenes such as Nativity or the Virgin Mary are usually blocks of small mosaic tile pieces that have been fired and painted. Smaller mosaic blocks can be purchased that have a regular or irregular design pattern, and these blocks can be placed in a wide variety of patterns to create a custom look, one that blends naturally with wood, glass, or other materials. Some mosaics made from natural stone have been given a special sealant and polish, and these blocks are suitable for exterior walls. Certain religious denominations have tended toward and now favor a church exterior that features tile squares constructed of glass or glass/natural stone insets. These tiny tiles are attached to a sturdy backing material and can be placed directly onto a firm substrate base. Whatever the use for the mosaic and whatever materials are needed, Stonexchange and Nalboor Tiles is ready to supply the proper natural stone or glass product. We import in bulk quantities and maintain a full inventory of the most popular and most requested designs. Many of our clients are contractors who need thousands of mosaic tile blocks for the interior design of a church or other commercial building. In most cases, standard size or shape mosaic blocks can be packed and shipped from our distribution center in just a few days after the order is received. Some manufacturers of mosaics buy raw material from the company that owns quarries. The material may also be purchased from a broker. In both cases, the eventual wholesale price will be slightly inflated because profit is realized each and every time the material changes hands. Stonexchange offers an alternative that contractors, installers, and flooring product merchants will find very attractive. Stonexchange opened its natural stone import business for the purpose of offering commercial clients and individual consumers the opportunity to buy direct from the manufacturer. Our company imports large quantities of marble, granite, travertine, and glass/resin products on a constant basis. We manufacture, import, and distribute most of our materials in bulk quantities. This means that truly wholesale prices are offered to those who choose to do business with us. Our freight costs are lower than average because we import full container loads of a specific product. Many of our commercial clients order thousands of tiles, mosaics, window sills, floor thresholds, and paver stones for use in large construction projects such as residential developments, hotel renovations, and public buildings. A church certainly qualifies as a major construction or renovation project, and the amount of natural stone – especially mosaics – needed to fill the order is generally very large. Our products are owned by us from the moment they are manufactured. We do not pay other companies for raw materials because we own and operate the fabrication centers. We can therefore offer some of the lowest prices in the industry because our products change hands only once, with the end-user being the recipient. Some mosaic designs are advertised throughout the calendar year by those resellers who purchase them. However, the material may not always be available because these merchants are competing for what is often a very limited supply. Some quarries and manufacturing operations are seasonal in nature, and finding the perfect design when it is needed for a construction project can become quite difficult. Stonexchange takes pride in maintaining a full inventory of all the popular mosaic designs and patterns we showcase on the Nalboor Tiles website. We manufacture our products year-round, and we import product in accordance with the amount purchased by clients. This keeps our warehouse full and guarantees product availability even when construction activity slows during the winter months. We ship our mosaics in full crates or fully loaded pallets. The orders are delivered via overland freight service throughout the continental United States. Orders for standard sizes of mosaic tile blocks can usually be processed and shipped in just one or two business days. Our mosaic designs include tiles made from travertine, marble, ceramic, and glass. Many of these designs include the use of rectangular borders and square tiles for the center. The patterns are too numerous to mention here, but customers can request a specific color block pattern in a variety of block sizes. 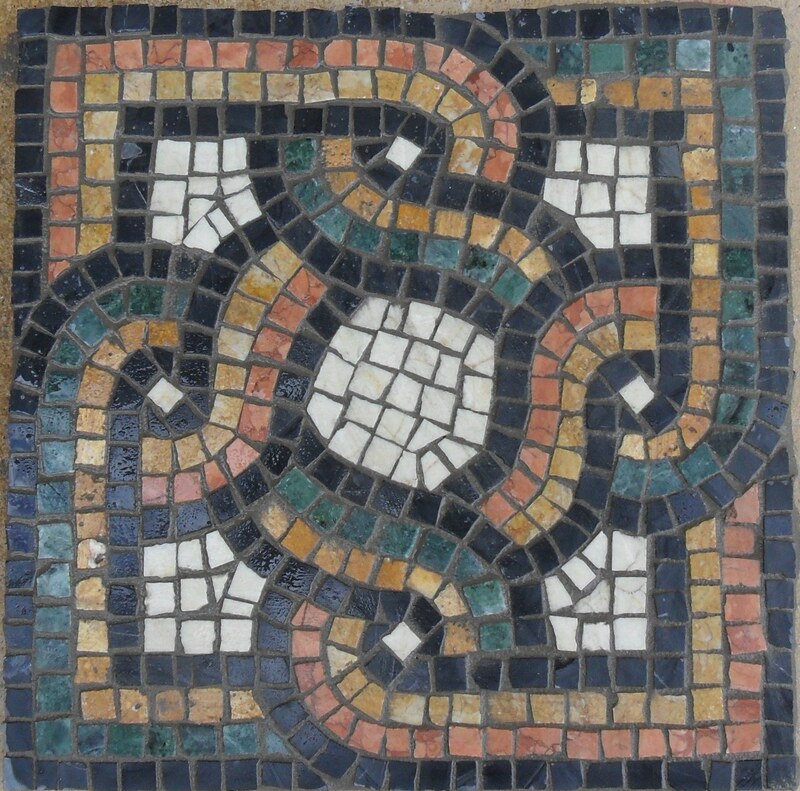 Most of our standard mosaics are 12-inch square or 6″ X 12″ rectangles. Some of these have a polished surface and contain painted ceramic inset pieces. Our mosaic tiles are carefully attached to a mesh backing, are packed tightly in shipping containers, and are shipped to the customer ready for immediate installation. We can produce non-standard size mosaics in a variety of patterns. Our company does not charge extra for this service, although delivery time may be delayed because of the custom manufacturing process involved. Huge orders of custom-designed mosaics are often shipped directly to the customer from our overseas manufacturing center. Our mosaics are constructed from the very same materials as our popular window sills, floor tiles, and transition thresholds. The products are made from natural stone taken from a specific set of geologic deposits, and our glass/resin products are manufactured using a specialized mix of materials. This means that customers who order several different products from our company can rest assured they will receive materials that are perfectly matched in color and patterning. Nalboor Tiles is the consumer’s gateway to fantastic savings on smaller orders of natural stone, stone and glass mosaics, and other interior design accessories. The lowest prices are enjoyed by those who purchase in bulk, but Stonexchange has set up the Nalboor Tiles website to showcase all of the products we offer in smaller quantities. Remember, the more you purchase, the lower the cost per square foot. However, everyone who buys direct from us will save big over retail prices seen at the local flooring product outlet stores. Churches often undergo a minor renovation, with a replacement project for the interior design calling for the use of newer mosaics. Catholic churches usually have a large amount of natural stone inset designs, for example. Lutheran churches often incorporate glass or glass/resin mosaics into a design that also calls for the use of a great deal of stained glass. These renovation projects can be very expensive if the raw material must be purchased from several different suppliers. Stonexchange offers clients a truly wholesale price on mix-and-match orders. A large amount of travertine mosaics and a small amount of glass/resin inset pieces can present quite a challenge for some suppliers and distributors, but Stonexchange is always ready to construct a customized order that includes smaller amounts of a specific material, even if the product in question is a custom-designed mosaic. Nalboor Tiles features all of the natural stone, engineered stone, and mosaic design patterns available from Stonexchange. We are ready to prepare a complete order package no matter how large or small the construction project. Our prices for mosaic tile blocks vary according to the amount ordered by the client, but all who purchase from us will enjoy a significant discount over what is offered by local retail merchants. Contact us with any questions regarding shipment, custom orders, or bulk orders involving multiple products. We can supply a wide assortment of mosaic patterns for churches, and we offer the lowest prices in the industry. In addition, we offer rapid order processing and fast delivery to all corners of the nation. Yellow to gold tone tumbled travertine tile. Tumbled tile gives any wall an antigue warm look. New generation White Crystallized Glass Panel Porcelain backed laminated tiles. Also called Marmo Glass. This product is perfect white. This natural travertine tile is perfect for both interior and exterior projects. It has ivory and beige background with some rose tint coloring.